IMPORTANT NOTE: Kaltura's screen recorder will not be available for new versions of Chrome or Microsoft Edge due to to the fact that they do not support Java plug-ins. The Kaltura plugin for desktop allows users to capture part of their screen and send it directly to their Kaltura library. 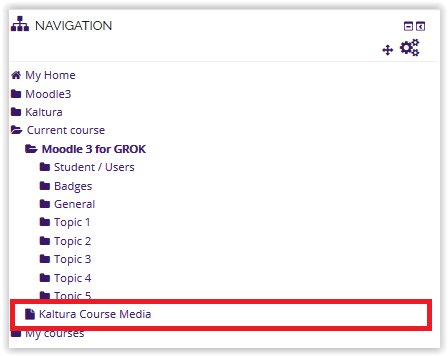 It boasts several features that enable instructors to record and manage video and audio content in their Moodle courses. Specifically, it provides a Kaltura Video Assignment and a Kaltura Video Resource option. Any videos uploaded through these means are manageable through the My Media area in your Moodle Navigation Block. Additionally, the plugin provides some viewership metrics in the form of per-course reports. The Screen Capture feature allows you to record an image of your screen activities as a video and include an audio narration. You can also insert a video image of yourself through a webcam. NOTE – this feature requires the JAVA plug-in to be installed and active within your browser. For Download information about JAVA, see: http://java.com/en/download/. 1. Open Kaltura Course Media from the Navigation block in the top left. 2. 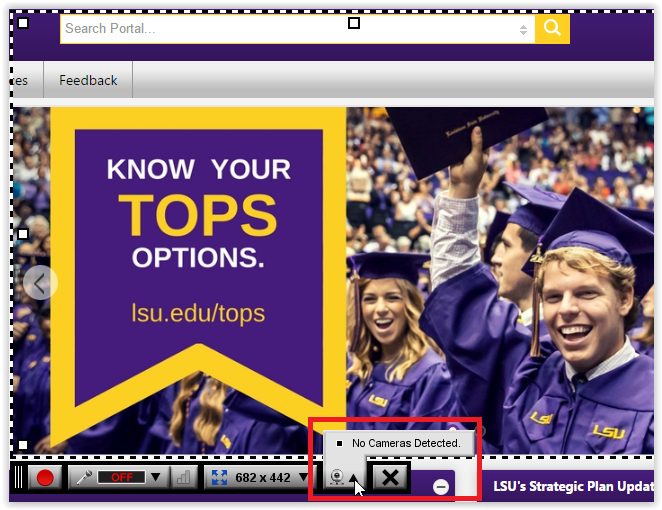 Select the Add Media button on the right side of the screen (or the Add Media Submissions on the already created Kaltura Video Resource). 3. An upload screen should appear. 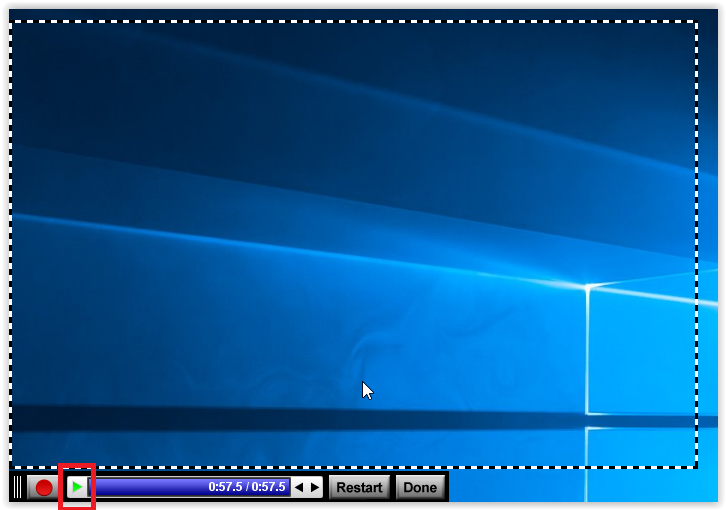 Click Add New in the top right-hand corner of the window, and then select Screen Recording. 4. Click Launch the Screen Recorder (You will need to enable Java to do this). 5. Go to the website and open CaptureSpace Lite. Note: When you first run the the Kaltura CaptureSpace Desktop Recorder client, it MUST be done via the website first. 6. If you have a webcam on your computer, you can also include a video image of yourself. To enable this option, click the Video Menu and select your camera. 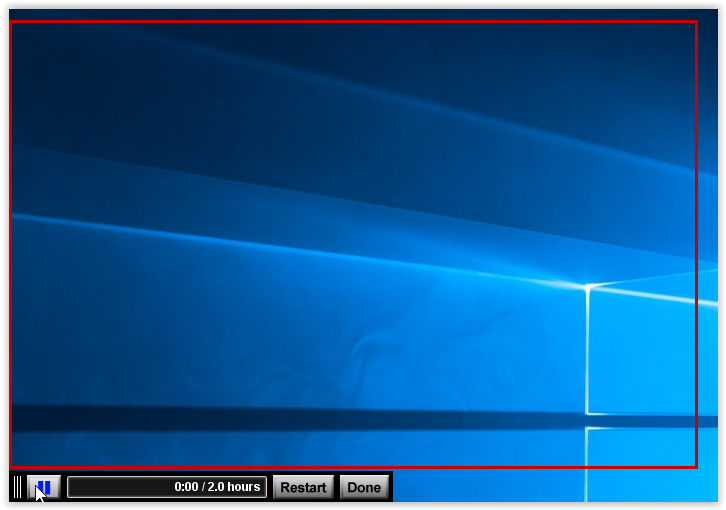 The video image will be inserted on the lower right of your capture area. The video image will not appear within the frame while you are recording. If you are recording a PowerPoint presentation, you may want to allow extra space on the right side of the frame so that your video image does not cover your presentation slides. 7. When you are ready to begin recording, click the Record button on the control bar of the frame. You will see a countdown for 3 seconds until the recording starts. 8. While you are recording, the Record button will become a Pause button. The timecode meter will show the length of your recording. Click the Pause button to stop recording. Click Restart to record again, or Done if you are finished. 9. A preview box will appear that shows your captured video. Click the Play button to review your video. If you want to make a different recording, click the Cancel link and start the recording process again. If you are satisfied with the recording, enter a Title and then click the Upload button. 10. Your video will be uploaded and then available for insertion as a Kaltura Resource Video. 11. 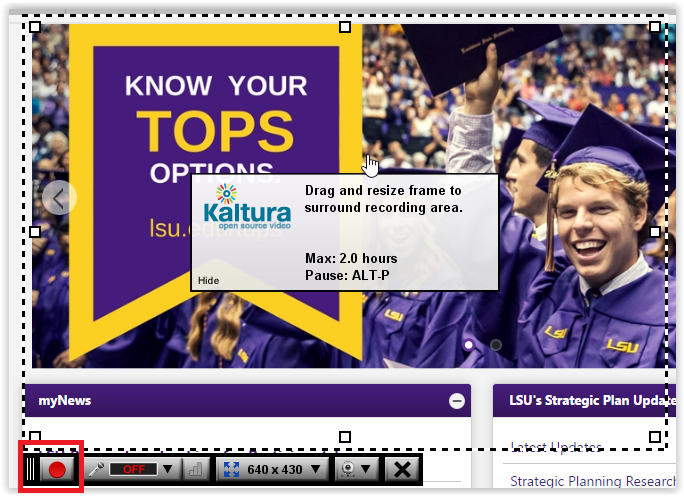 See the article: Adding a Kaltura Video Resource to add this screen capture to your Course.